There was a time in my life when I dreamed of living in California even though I never visited California for the first time until I was 18 years old. When I was in high school, I dreamed of attending UCLA for college to study filmmaking. When I was in college, I dreamed of attending UC-Berkley for grad school to study documentary photography. I pictured California as a beautiful state with mountains dropping into the ocean and lots of sunshine. 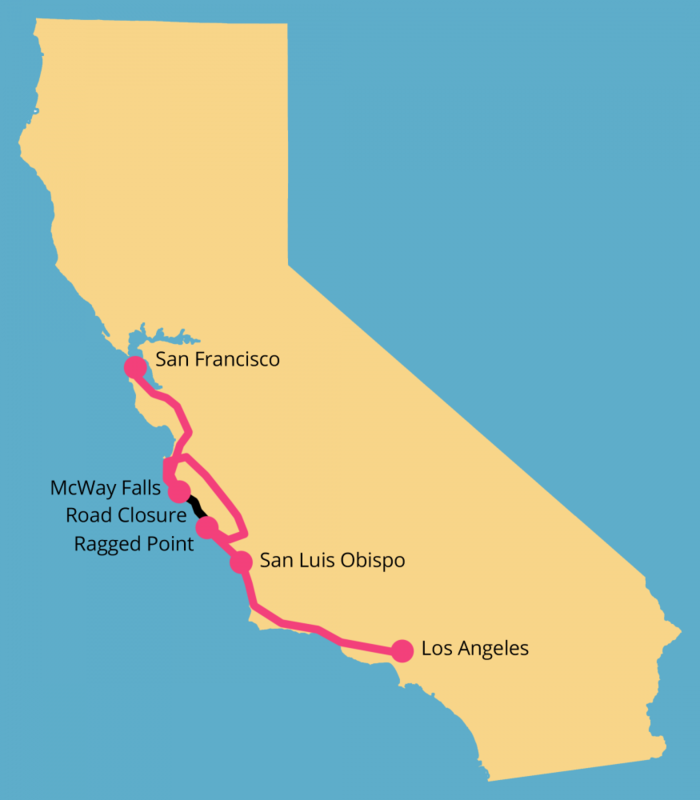 I can’t pinpoint how I exactly first learned about the Pacific Coast Highway, but it is likely through one of many travel publications I read regularly. When Alex and I discussed about what to do when visiting his hometown, Los Angeles, I told him that I really wanted to take a road trip on the Pacific Coast Highway, as I have been dreaming for about a decade of witnessing the windy roads through California’s beautiful coast. Alex made the trip happen, and I am sharing my thoughts on my blog. Alex and I took off from rainy LA in a nice little Prius car. We made our first stop in Santa Barbara where I got a delicious crab cake sandwich for lunch at On the Alley, a restaurant offering reasonably priced meals for those on a budget. We then continued on the Pacific Coast Highway, also known as Highway 1, to San Luis Obispo where we spent a night in Madonna Inn and another night in an Airbnb. During our two days in San Luis Obispo, we visited a Farmers’ Market where we tasted delicious barbecue meat and apple pies, climbed the “P” mountain, one of the mountains in the town, ate the most delicious tri-tips at Firestone, walked around the town center, and strolled at Avila Beach. 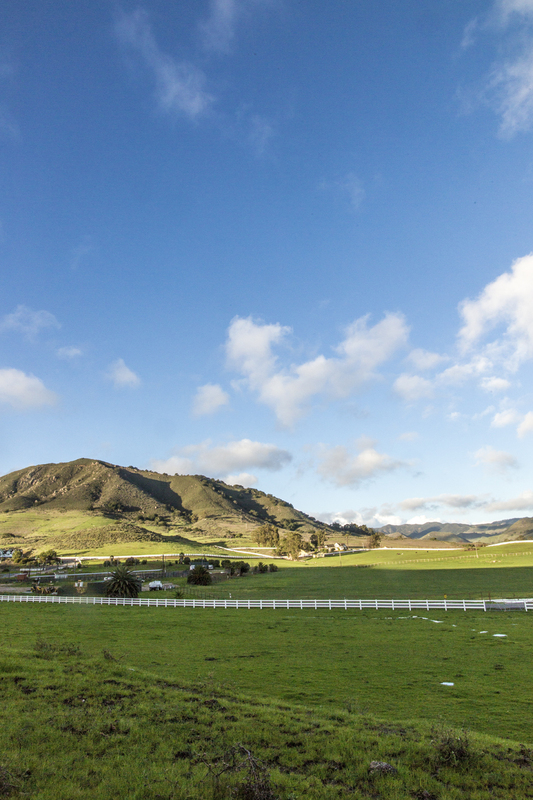 We continued our road trip after our two-day stay in San Luis Obispo. Alex and I were supposed to spend most of the day at Big Sur, but we encountered a road closure on the way that was not marked at all in Google maps and so we had to back track a bit and make a huge detour driving through the farm fields and passing all of Big Sur. Thus, we arrived at the north of Big Sur late in the afternoon, giving us only a few hours to travel south and photograph. Then we had to turn around and make our way back up north to the San Francisco Bay Area. 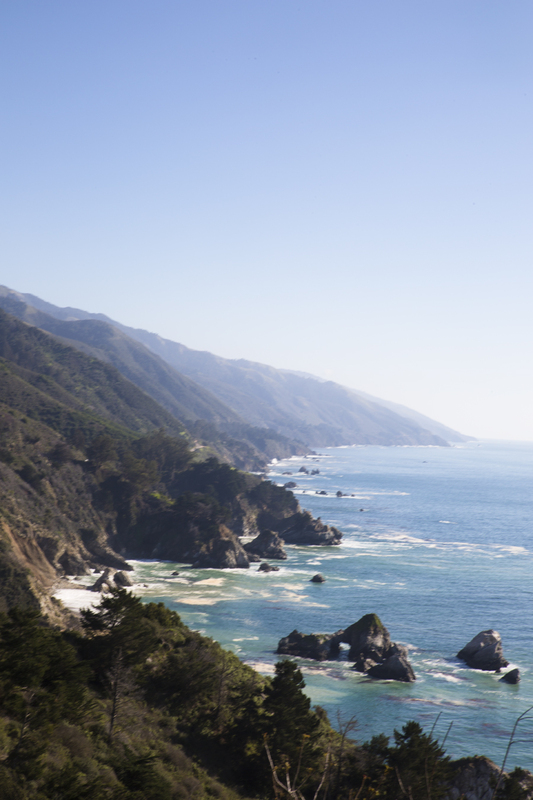 I was so sad that I had only a few hours at Big Sur, a place that appears to be so magical at every turn. I felt rushed, having no time to be immersed in one of the greatest beauties on the planet. Alex was the most incredible boyfriend. 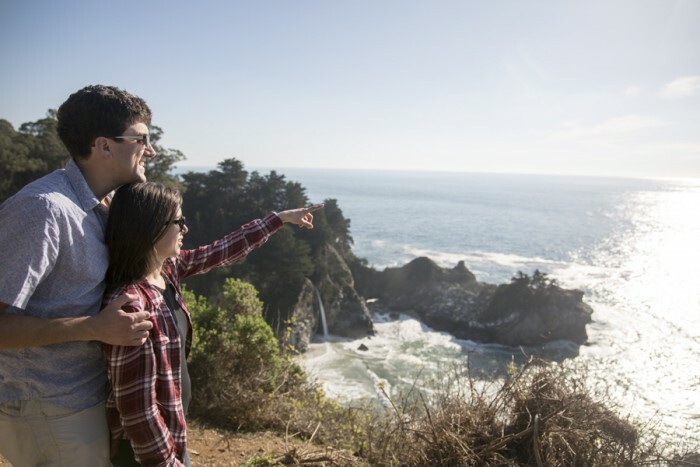 He took his girl back to Big Sur two days later. 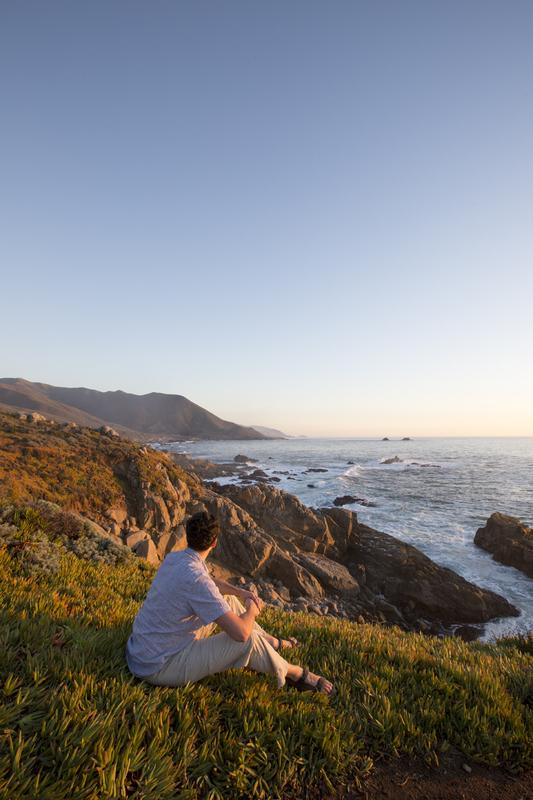 This time, because we had most of the day at Big Sur, I was able spend quality time relaxing and soaking in the sun. More importantly, I was able to take time to view the scenery and take pictures. Alex and I spent the following three nights after San Luis Obispo in East Bay with his friends and then two nights in Mill Valley. I will write a separate blog post sharing my experience in the San Francisco Bay Area. 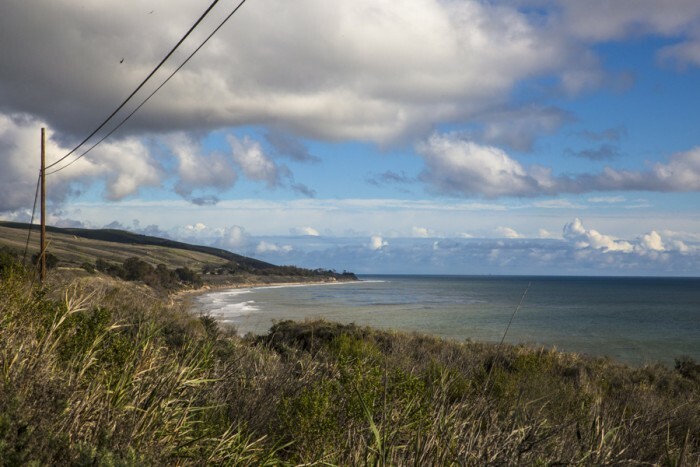 Santa Barbara is a beautiful town on Highway 1 route. 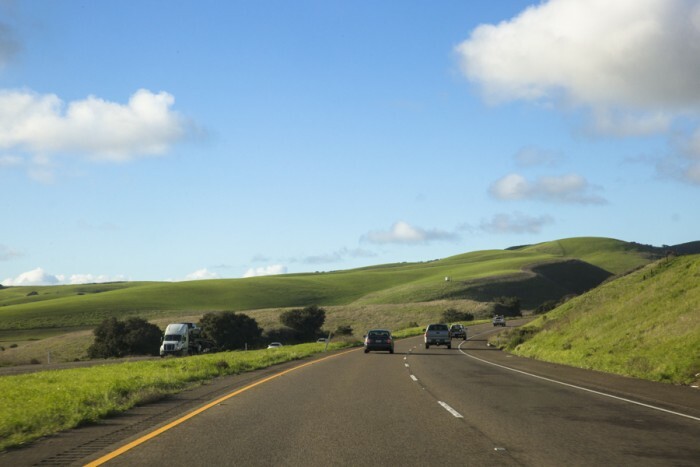 Pacific Coast Highway is full of green rolling hills (although this has only been recent). Isn’t this a glorious scenery? That mountain screams, “Please come climb up!” Serro San Luis Mountain which is located next to Madonna Inn has trails. 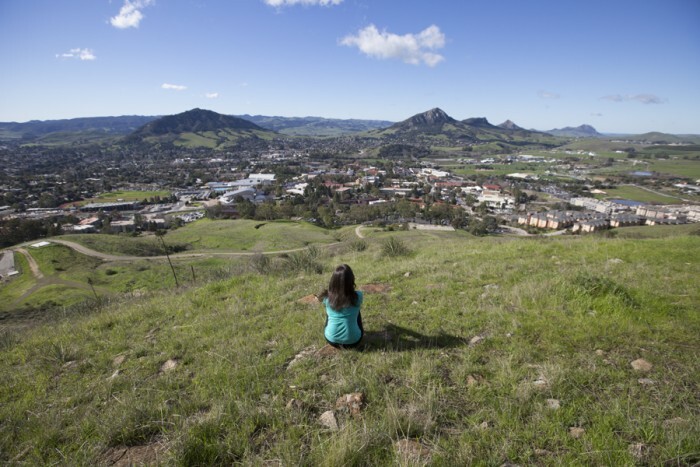 San Luis Obispo truly offers the most stunning views of mountains. Madonna Inn’s rooms are epic! 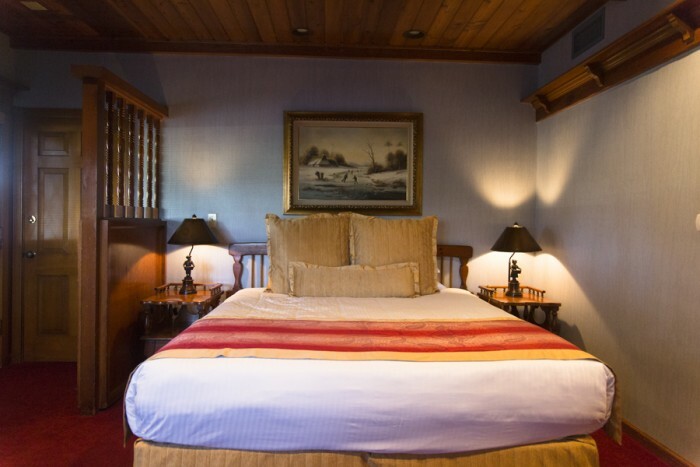 Treat yourself to a night of feeling like you’re in Switzerland by reserving the “Swiss Chalet” room. Doesn’t the restaurant look like you can feel like you’re a princess or prince? 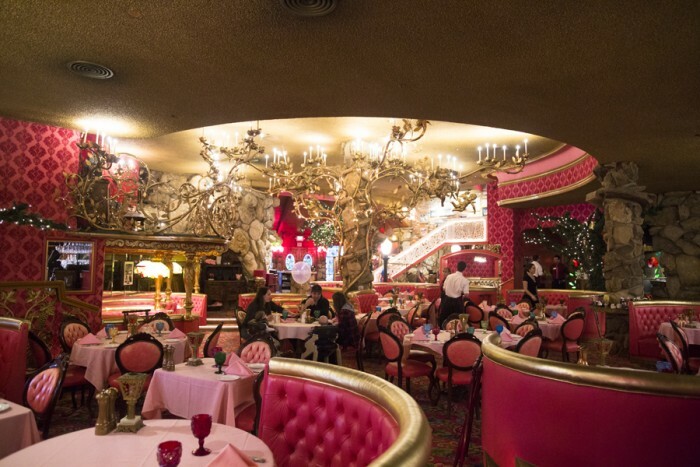 I told Alex that if I was a little girl and had known about Madonna Inn’s restaurant, I’d want my birthday party to be there. 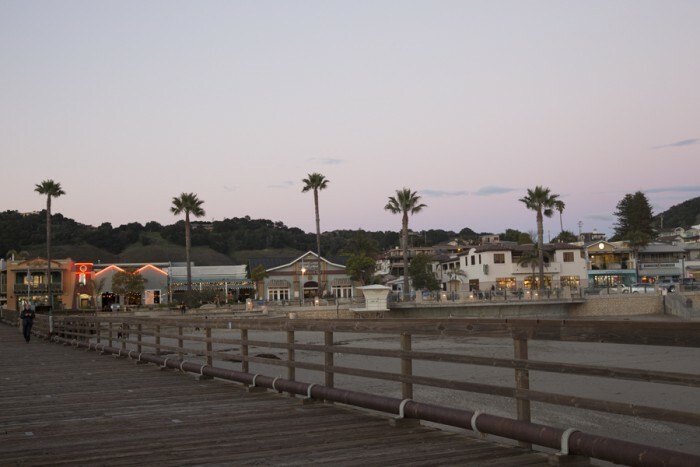 Avila Beach offers great dinning views. Seeing the colors of the cliff as the sun sets is magnificent. 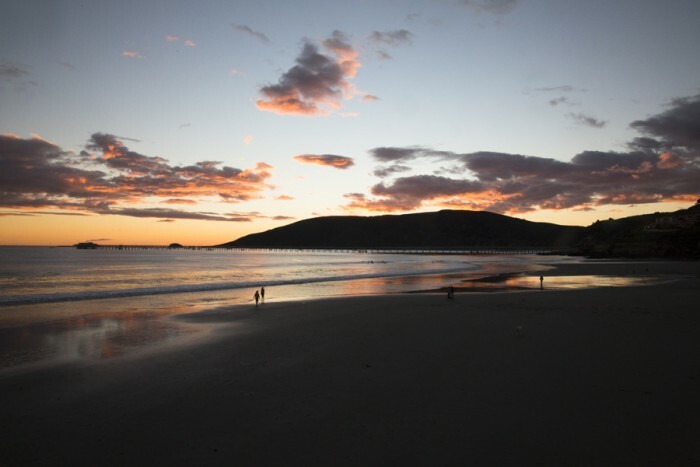 Avila Beach does offer quite a dramatic sunset viewing. 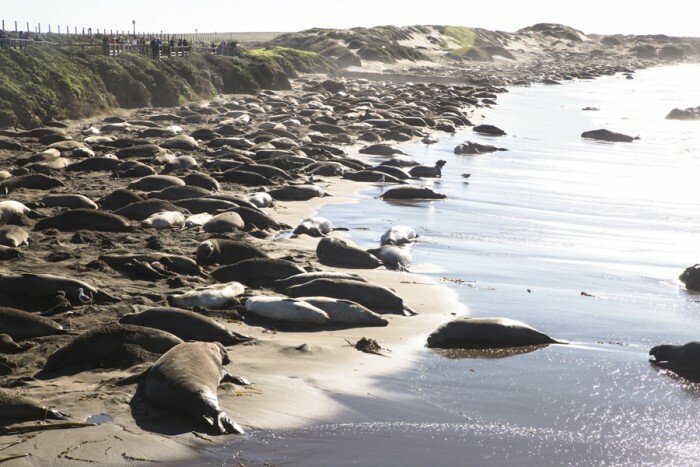 Elephant Seals can be spotted on the route, located just past Cambria. 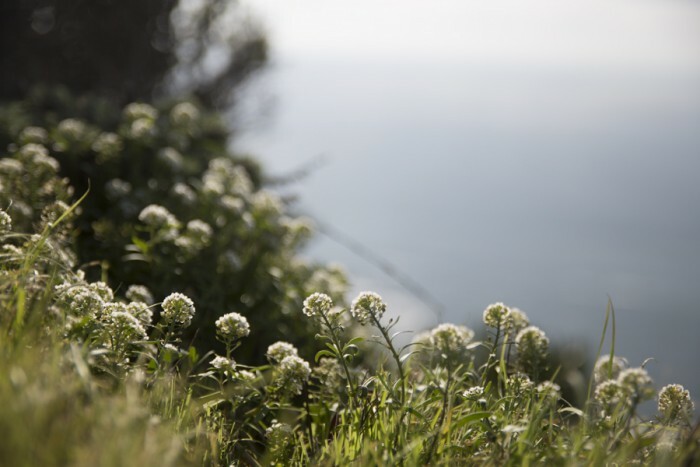 Beautiful flowers are spotted along the highway, even in middle of winter. This is at Ragged Point. 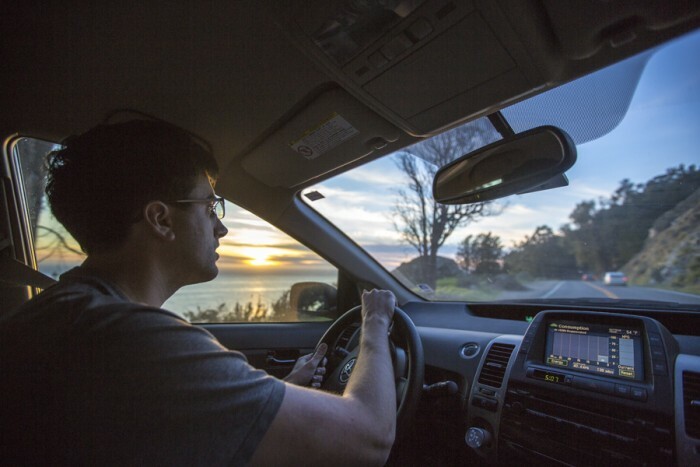 The drive is never ever boring. Never boring. The views from the car is always so enchanting. 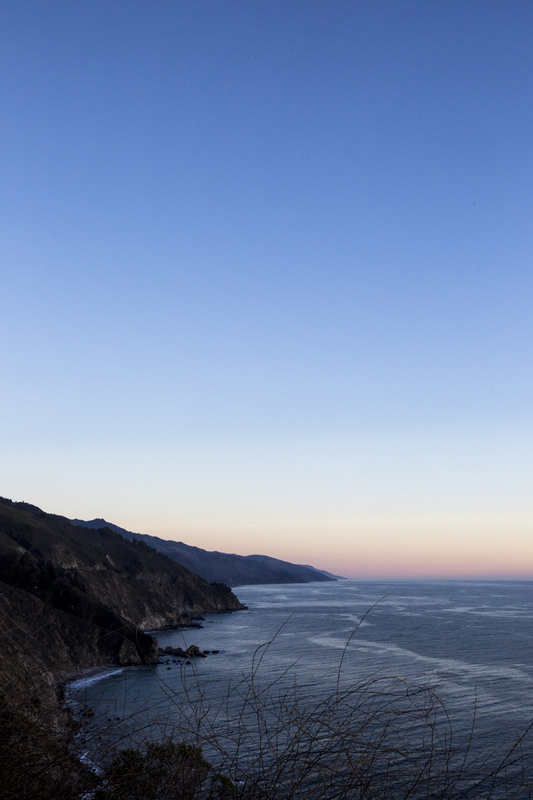 The sunsets on Big Sur are never boring. 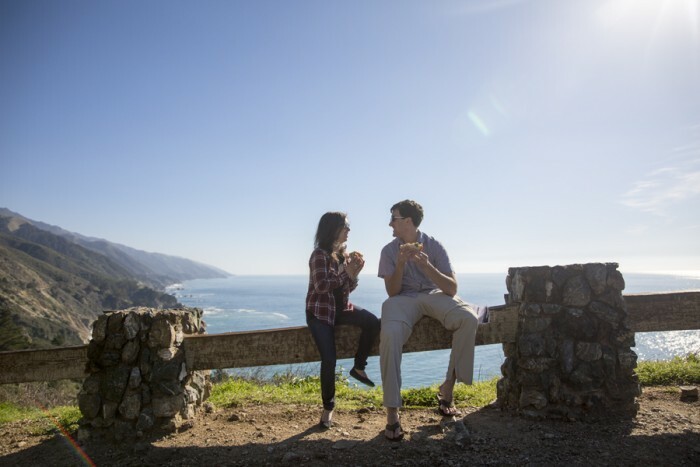 Big Sur offers a number of secluded spots to enjoy special moments with loved ones. Imagine spring time. There would be many more beautiful flowers. There are unlimited unparalleled views for picnic lunches. Seeing mountains drop into the ocean is so breathtaking. 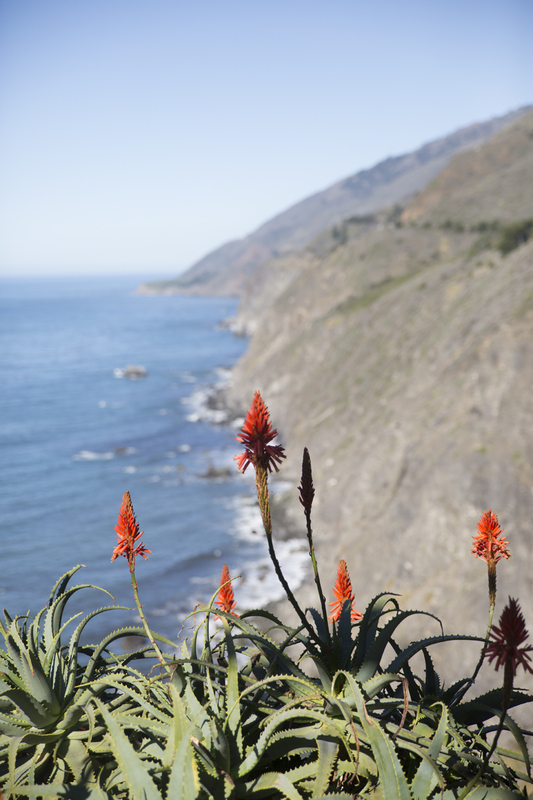 Pacific Coast Highway offers variety of sights and sounds to discover. 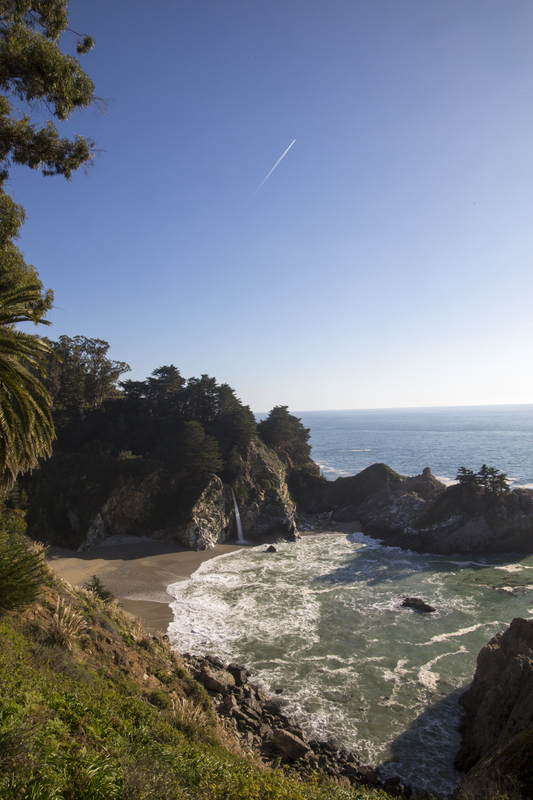 McWay Falls is one of the most beautiful spots to witness. 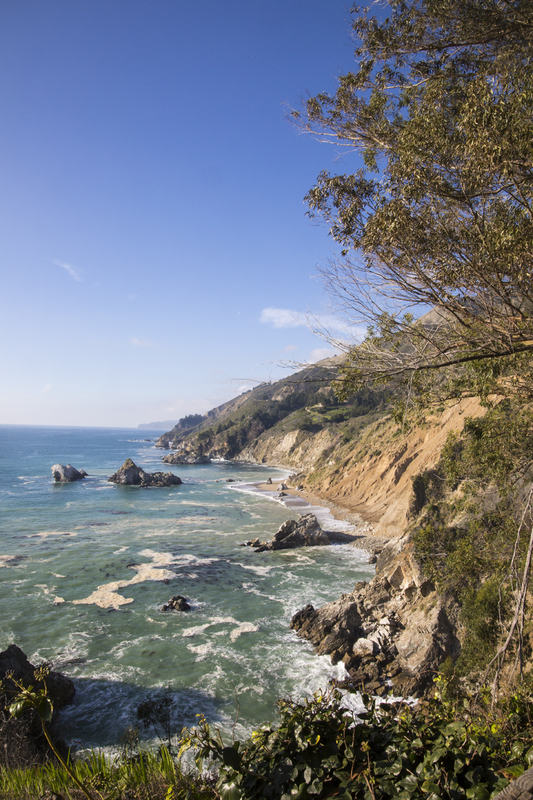 Viewing McWay Falls, a waterfall right on a beach, was one of the most magical things to see on Pacific Coast Highway. 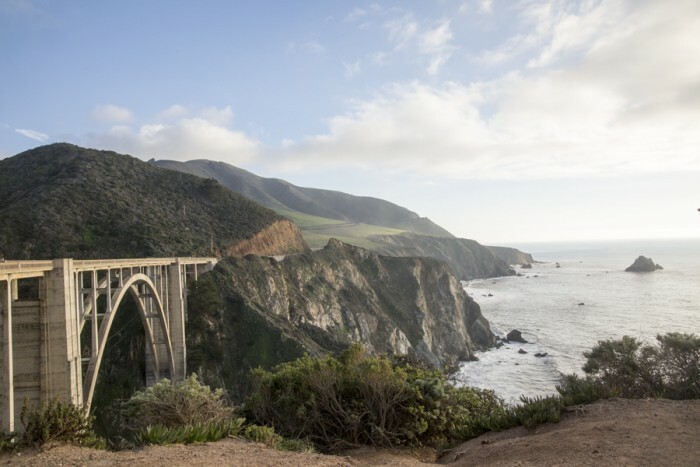 One of the most “photogenic” bridges in the world, Bixby Bridge, is located in the heart of the Pacific Coast Highway. Everywhere we went on the Pacific Coast Highway, we were constantly blown away by the geographic formations of the coast. We can never get bored of sitting and relaxing by the golden shores. 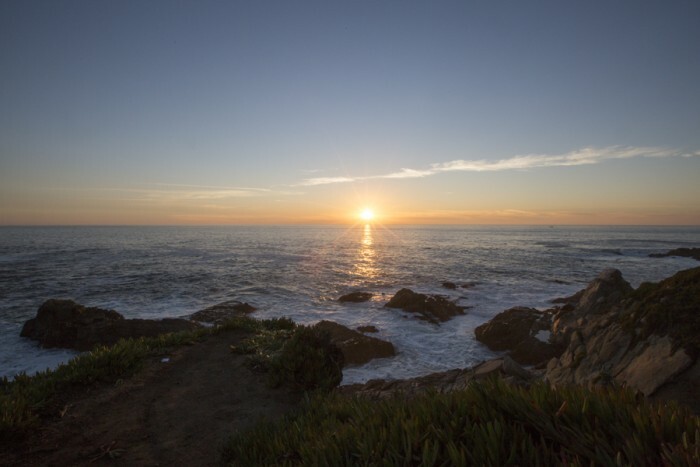 Every minute of sunset viewing is a worthwhile at Big Sur. 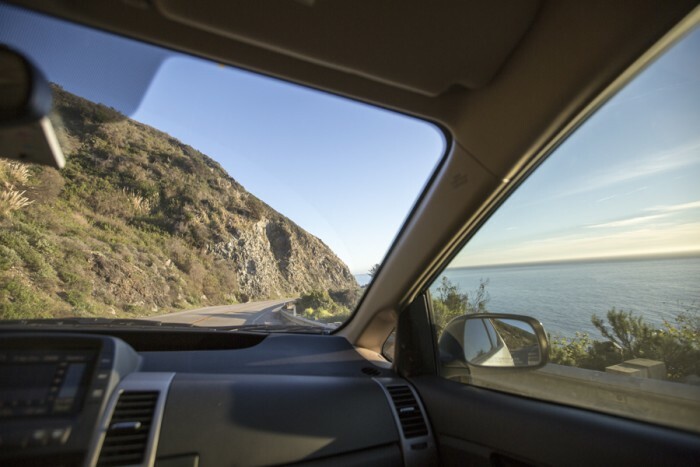 Pacific Coast Highway leaves us with treasured memories that will last a lifetime. On the Alley || Located by the water. Offers a good selection of sandwiches and tacos at a reasonable price for those traveling on a budget. Firestone || Located in the heart of the town. Makes the best tri-tips sandwiches in the world. Farmers’ Market || Takes place every Thursday evenings. Wide variety of food vendors. F. McLintock’s || Located in the town center. Offers a good selection of hearty breakfast dishes. Try their french toast which tastes like a cinnamon roll. Madonna Inn || San Luis Obispo || A very unique hotel with imaginative interior design. Each room is individually decorated with a theme. 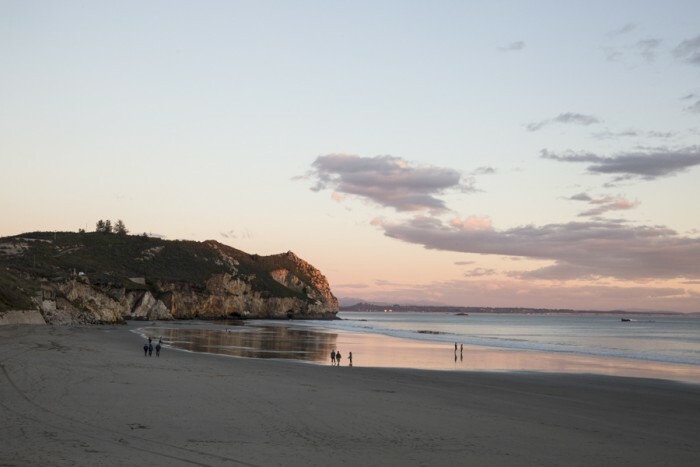 Airbnb || San Luis Obispo || Simple private room that includes all basic amenities. Brings back memories when a friend and I did the same drive – from SFO to San Diego in two days. 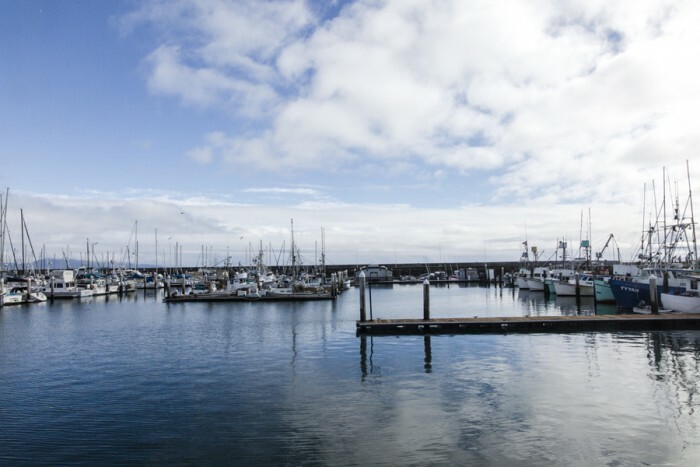 We also stayed in San Luis Obispo. In all the times I’ve been in LA/SFO, I have never seen it that green. Looks lovely.